Imagine that you’re an MMO player who wants to level up your character quickly but doesn’t want to miss any of the game’s story line. Generally, you’d have two choices: buy a level boost and skip right over all that content, or take the long road and do all the leveling yourself. Well, now players of Star Wars: The Old Republic have a third choice. Bioware has decided to implement a new kind of boost that allows players to take any non-maxed character right up to level 70. The difference is that this one doesn’t progress the character’s story, meaning a player can get that boost and enjoy the narrative at their own leisure. 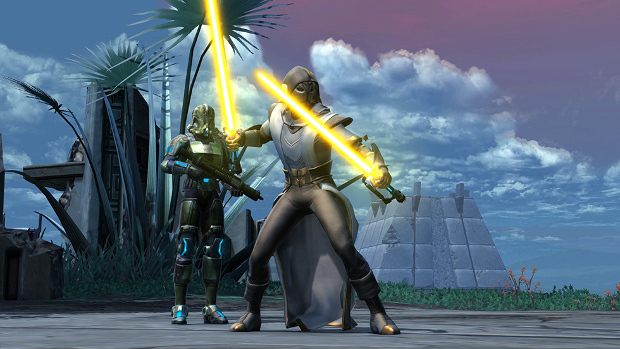 The Master’s Datacron comes as part of the Eternal Commander Equipment bundle in the “A Traitor Among the Chiss” Update. This bundle assures that players who purchase the boost will be properly equipped. The bundle will run 2,000 CC, or players can attempt to buy it on the GTN. Detail on how to use the boost are available on the SWTOR site.